First Line: A drop of sweat rolled down my back as I rang the doorbell of the mansion. 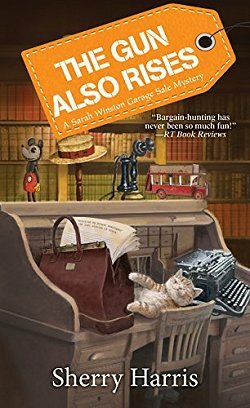 A wealthy elderly widow has asked Sarah Winston to catalog and sell her massive collection of mysteries so that the money can be donated to charity. While sorting through piles of books stashed in the attic, Sarah is thunderstruck when she finds a case of lost Hemingway stories which were stolen from a train in Paris back in 1922. How on earth did they wind up in this attic in Massachusetts almost a century later? Before Sarah can get any answers, the widow is assaulted, the case is stolen, and a maid is killed. Then the rumor starts that the widow also has a limited edition of Hemingway's The Sun Also Rises. Sarah finds herself surrounded by reporters and treasure seekers and has to go to extraordinary measures to avoid them while she searches for the person who's willing to kill for the Hemingway goodies. I found myself stumbling across this series midway through, and I've really been enjoying it. With a plot that includes hundreds (if not thousands) of mysteries tucked away in an attic and a treasure trove containing a Hemingway rare edition and those lost letters, The Gun Also Rises was guaranteed to keep me turning the pages. Not only was I wanting to be turned loose in that house of books (it's also got rooms of first editions), I had a very good mystery to solve. There's plenty of misdirection to keep readers guessing, and Sarah always includes the local police whenever she finds anything. I like that. Nothing can make me grind my teeth faster than an amateur sleuth who insists on sneaking around a perfectly capable police force. However, in many ways, the part of the book that had my sympathies working overtime was when Harris describes the hell Sarah Winston must go through in order to avoid all the reporters, paparazzi, and treasure hunters who think nothing of making her life a misery. I felt Sarah's pain and really wanted to help in some way. I really like Sarah Winston, and I really like the mysteries Sherry Harris concocts for her heroine to solve. Long may her Garage Sale mysteries continue! I love the idea of a series of books featuring someone who...catalogues and organizes books! That's a great concept, Cathy. And it sounds like an interesting story. She doesn't just work with books, though, Margot. She normally runs garage sales, and she's dealt with some very interesting things throughout the course of the series. Cozies aren't usually up my alley, but this one looks good. And I used to co-coordinate rummage sales, so it is kind of familiar territory. I may try this if the library has it, if I ever read what's on my plan for the year. I find that I like to pick up a cozy after reading mysteries that are dark and/or nerve-wracking.